Vince buys a Cape comic on a street corner, which made me sit up and wail, "Why can't I just buy comics on street corners?" He finds a disused underground space, perfect for a secret lair, and gets to decorating. First thing he does is to tape up a photo of Peter Fleming, just in case he forgets what his nemesis looks like. On the other side of town, Fleming is literally moving pieces of his plan around on a virtual chess board, and my throat hurts from this show cramming so much badly managed metaphor down it. Mr. Portman -- prison Secretary, remember? -- is almost nabbed and stabbed by Cain, disguised as a janitor, but Orwell swoops in and rescues him. I was a blogger once, and I don't remember being omnipotent, but maybe I just wasn't doing it right. There's a flashback somewhere in here about the strength of the Faraday name, which would be a total waste of film if the baby playing Baby Trip were not adorable. But he is, so I'll let it slide. Arts and crafts time in the lair! 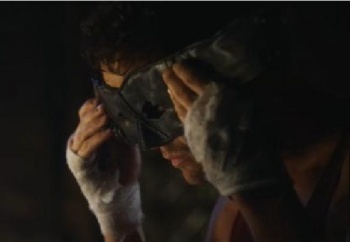 With Max sneakily spying, Vince sews together a mask. He surveys his work, looking first oddly aroused, then weepy, then angry, as he puts the thing on. It's an okay mask, nothing special. Certainly not arousing. The Cape is wailing on a punk named Linus, threatening if he doesn't talk, the whole underworld will hear that he did. Linus agrees to meet him at a bar later, and disappears just as Orwell struts into the alley in heels and a big Gucci belt and kicks another thug in the head. She tells Vince that the tattoo we only barely saw too much of? It says that Cain belongs to Tarot, the secret society of killers that must not be so secret. Oh, hello, rogue's gallery! So nice to meet you. Vince gets to the agreed-upon bar to meet Linus, only to find that Cain got there first and poisoned everyone in the place. Vince rushes to find Secretary Portman, just in time to prevent him from drinking some maybe-poisoned booze. In the ensuing conversation, Portman raises his voice, and I see Toby from The West Wing, and that's the most exciting thing that happens in this scene. Oh, that's right, Dana overwhelms the prejudice of her married name to talk her way into a job as a lawyer. It feels about as tacked-on as this sentence. Max finally returns Vince's cape, so he doesn't look foolish running around town calling himself The Cape without a cape. Orwell finds out that Portman and Fleming are meeting at a restaurant, which wouldn't be a problem, except Cain is an ex-chef, as well as being as poisoner. Orwell snags a table by pretending to be a food blogger, then dresses up like a chef to get Portman's poisoned food away from him, The Cape saves the day by grilling Cain's face and trussing him up like a bird, and Fleming looks mildly annoyed. Secretary Portman turns down the proposed ARK prison takeover to mild applause, and Dana and Trip bond over the fact that, while the situation is sad, "they can't take away our memories." "They," presumably, are the media, making news by demonizing Vince's corrupt-cop memory. So that's The Cape. It's incredibly fractured and has horrible pacing problems, but if you think of it as a comedy, it's almost enjoyable. The promos for next week promise "more danger than you can throw a cape at!" The preposition-capped sentence is a cheery foreboding of what's to come, right?